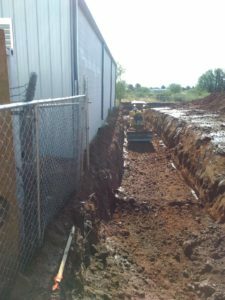 Sierra Dental - KE&G Construction, Inc. 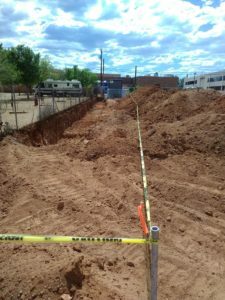 The Sierra Dental project was site work for this facility and completed by our Sierra Vista Team. The team included Ben Carter, John Drake, Cesar Acuna, Rick McMahon, and Ramon Morales. 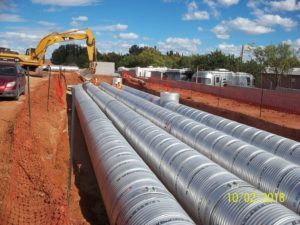 The scope of work included installation of SWPPP BMP’s, removal of existing parking lot & improvements, cut to export 5400 CY, 100’ 4” sewer with clean-outs, 312’ of 4” PVC fire line, 312’ of 2” copper water service, irrigation stub, backflow preventives, 200’ PVC storm drain (6-12”), 604’ of 48” CMP stormwater retention system, 75 CY grouted and dumped rip rap, 518 CY of 4” thick MAG ABC, 724 TN asphalt paving, and parking lot striping. Access was a challenge on this project with only one way in and one way out. The site was very small, which made for a congested construction area with multiple trades working around each other. This led to a request from the general contractor for pricing to pave in two phases, which we completed. Concrete work was removed from our scope of work, and we agreed to bring grade to +/- 0.2.